I have been seeing the first bushels of corn show up in the grocery stores around here lately, and that is probably the real herald of summer for me, even more than school being out and the days getting hotter. You have probably had grilled corn on the cob before, but today we are taking it up a notch by making Mexican Street Corn! 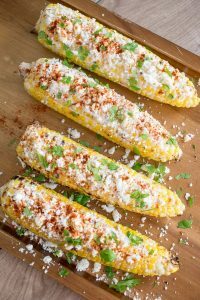 Covered in garlicky mayo and topped with Cotija cheese, cilantro, and chili powder, this is the perfect Mexican summer side dish for your next bbq or outdoor grilling! You forgot about that potluck tomorrow? 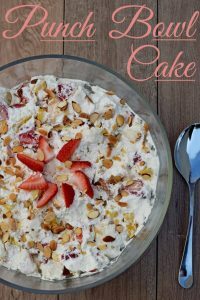 Don’t worry, your covered with this Punch Bowl Cake which can be made in 30 minutes if you use a store bought cake. With our new outdoor table, I am thinking we may forget what our dining room even looks like. Bring on the backyard bbq and some margaritas! It’s going to be a spectacular summer! Along with this beautiful tropical tablescape, I am sharing our best tips for glamming up your summer entertaining. Every summer is planned out with the best intentions. And then life happens. Even so, there are many great projects that were completed this summer from the coolest kid’s closet makeover to dreamy office lighting. Check out what you may have missed at the ‘ol abode. The hot summer days are keeping us indoors but the summer nights really come alive with these new string lights. 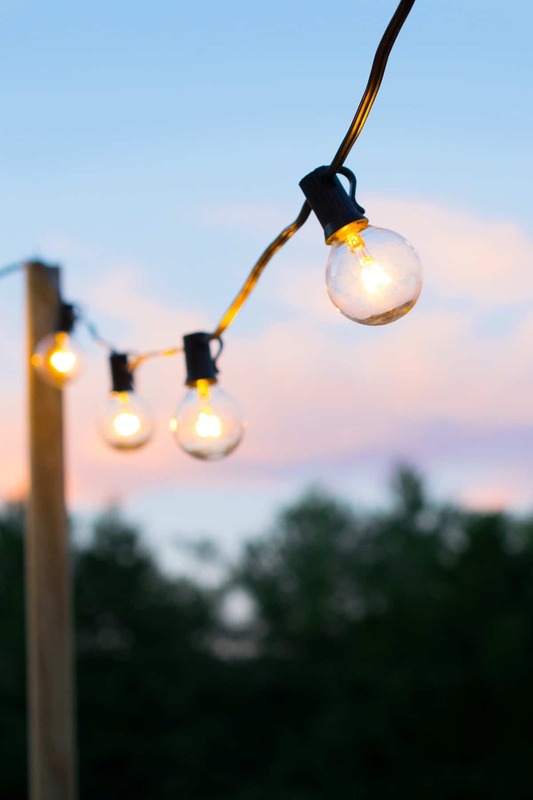 Even if you don’t have a covered deck or pergola, you can hang these in just a few minutes! Crafts that are beautiful and functional are always my favorite. 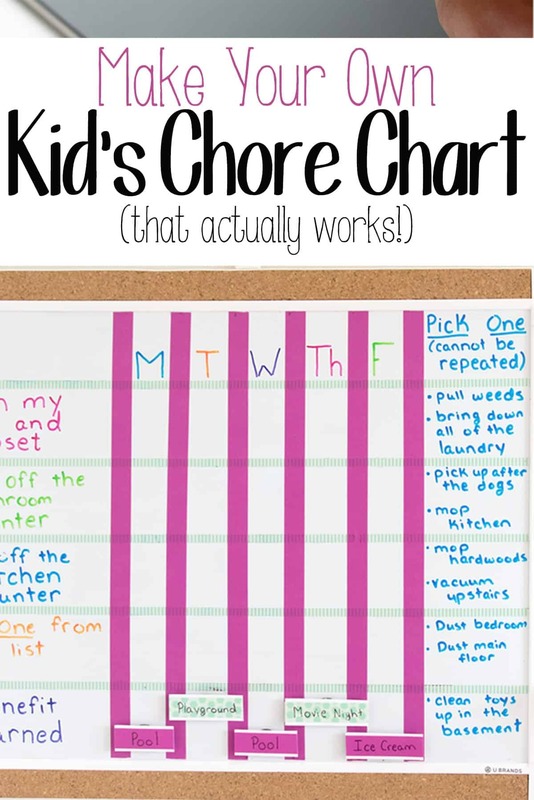 After several versions, I have finally came up with a Kid’s Chore Chart that actually works! 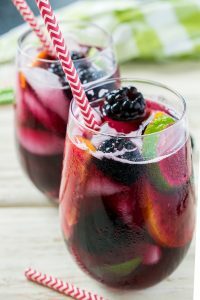 If you are looking for an easy summer cocktail to serve at an intimate gathering or for a crowd, everyone will love this refreshing Summer Blackberry Sangria. This make-ahead punch blends red wine, brandy, and plenty of summer fruit flavors. Ah, it is summer and the grill is calling! Today, I have put together a list of amazing summer grilling recipes and ideas that will get your mouth watering and your summer spirit soaring! Take that last slice of key lime pie and turn it into something amazing!! This Key Lime Milkshake is the perfect spring or Easter treat! Thick, creamy, and packed with key lime pie flavor, this milkshake takes only a few minutes to make by using a store bought pie. Summer is in full swing and nothing could be easier then a S’mores Bar. For a bit of change, add quick options like these Banana Split S’mores! This no-churn recipe for strawberry cheesecake is one of my two favorites! Although summer is over, it’s never bad weather for ice cream really. It’s the last week of the October dessert share-fest, but I hope you have enjoyed it as much as I have.